Archery competition is a winter sport. The season takes place between late November through March. 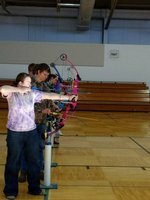 We are looking forward to hosting and competing in NASP (National Archery in the Schools Program) tournaments during the the 2017-18 school year. This is our inagural year for archery at COSLHS.